Warner Farm is a working farm as well as the home of Mike’s Maze. 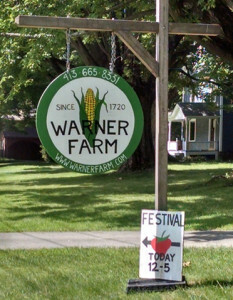 Warner Farm is one of the oldest and longest running family farms in New England. Ten generations of Warners have farmed in Sunderland since the 1718. Father and son Mike and David Wissemann continue the Warner Farm legacy by growing a wide variety of crops on 150 acres of fertile river valley soil. As a tenth generation farm, we are committed to growing practices at nourish the soil and promote the health and biodiversity of the land we farm and the surrounding area. We feed our community fresh, healthy, and sustainably grown produce. The farm was one of the first farms in the Pioneer Valley to offer pick-your-own strawberries, which we still offer every June. We are also proud to have over 400 members of our CSA farm share program in eastern Massachusetts, allowing us to share the bounty of our beautiful harvests across the state. In addition, we sell our produce at farmers markets and at our farm stand, as well as offering wholesale produce at the farm.